Controlling Carpenter Ants - Yes Pest Pros, Inc. Controlling Carpenter Ants - Yes Pest Pros, Inc.
Fall is upon us and winter isn’t far behind. As the first frost hits, many homeowners are fairly sure they won’t need to call their pest exterminator for at least a few months. Most people think their ant control issues are long over by the time the leaves begin to turn. After all, ants are a summertime pest – right? Not every ant will become dormant in the cooler temperatures. The large carpenter ant is sturdy enough to keep going even when temperatures drop a bit. 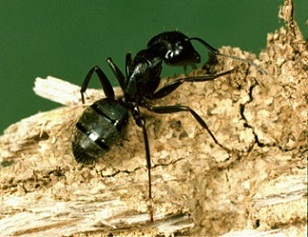 Carpenter ants are big ants, up to ¾ inches long for the queen. They can be black, red or a combination of both colors. They share a taste for sweets and carbs with their smaller cousins, the sugar ant. Outside, they favor honeydew which is a sweet substance produced by aphids. The will also feed on plant juices and sometimes, other insects. Colonies are often very long lived and tough to eradicate even for the best carpenter ant removal companies. Their expansive network of hidden tunnels and multiple entries and exits make them a difficult prey. They prefer to make their nests in within wood, typically dead or deteriorating wood that has been exposed to moisture. The can be a tree stump, woodpile or the wooden structure of your home. The wooden parts of your home that come into contact with the soil are particularly at risk as are the areas subjected to the most moisture, like to roof and window sills. These ants are most active in the spring and early summer when the nest produces daughter queens and males who will make their mating flights from May through July. After this, they will seek out a place to begin a new nest and start the cycle over again. This does not mean that carpenter ant control companies do not see carpenter ant infestations in the cooler months, too. Carpenter ants can and do nest within walls and anywhere there is wood for a cozy home. The original nest is probably outside and the daughters have set up shop inside. Your home — with its climate control and large food reserves — makes a very comfortable home for a carpenter ant colony. Integrated Pest Management techniques can be used to get rid of these annoying and destructive insects. There are a number of baits in different forms that can be placed by Young Environmental Solutions. Workers take the bait and feed it to the queen. When she dies, the nest dies. Gels, liquids and granules can each be used in the proper place to get rid of these troublesome ants.